With bells ringing like a Spector wall of sound and a Wagnerian sense of keeping it downplayed this is an album with a grandiose approach to one night stands. And it really is a special album, not only due to the music, but also the lyrics being, I don't know, more of full sentences and stories than what's in the average crotch rock singer's back catalog. 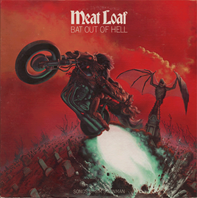 Meat Loaf's singing combines the rocker's force with the musical theatre's drama, but manages to make it sound fully acceptable. There's actually not much to complain about here - it's one of the world's best selling albums and it doesn't try to pass itself off as more important than just an album of metal / rock ballads. Checking what others have written, I see I'm not the only one noticing Wagner and Spector. Ah well, I can't be unique every minute of every day.